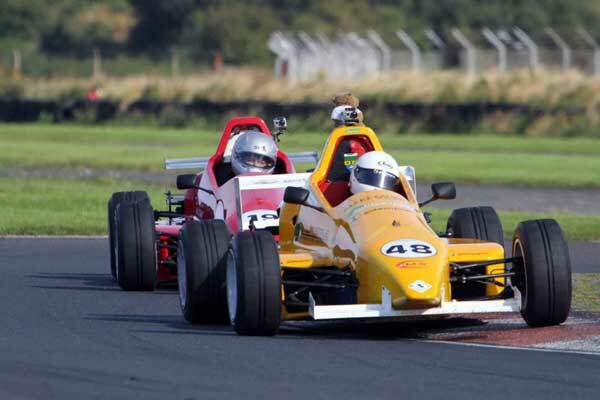 We catch up with Jennifer Mullan who headed north last weekend to the fast flowing racetrack in Kirkistown for round 7 and 8 of the All Ireland FF1600 championship! Well I’ve had worse weekends than last weekend at Kirkistown! After a pretty decent run in Mondello three weeks ago, I was keen to see if my new found speed was a one off or could I carry it over to a different track. I had an awful opening event of the year at Kirkistown so I was really hoping to go well at a track I get so much support at from friends and family. We headed off up the M1 after work on Thursday evening for Friday testing. Running doesn’t get underway until around 11am up north on a Friday and we got off to an ok start. In the second session though I thought my usual Kirkistown bad luck had followed me once again, coming into the Hairpin one of my drive shafts snapped in half, with no spare I was dispatched off to try borrow one from fellow Reynard driver Henry Campbell. Luckily for me, he had one and we were back on the road after lunch having missed no real track time at all. The rest of the day went pretty smooth with me getting faster each time I went out, and with a change of tyres and an adjustment to the handling of the car I was pretty happy with my pace at the end of the day. I reckoned if I could repeat it in qualifying I shouldn’t be too far away in the Pre-87 class battle. All that was left for the evening was to get the car through scrutineering and then to head for the club house for a nice bit of dinner. Having not really eaten all day due to the really annoying nerves I suffer with when I’m testing or racing, I was well ready for the big steak dinner that was to follow! Despite there being a great buzz around the bar, I made an escape at around 11pm and left the team behind me and headed back to the guest house that we were staying at to get some much needed sleep. Qualifying on Saturday morning wasn’t until 11.30, so it was a very relaxed start to the day. When we took to the very sunny track I was just behind Henry, the main car I was trying to beat for class honors. I stuck behind him for a lap to two before I realised I could go quicker and moved in front. I got my head down over the next few laps and nearly matched my best time from testing, I could see I was P1 in class on my pit board but I wasn’t convinced I had done enough to stay there. Thankfully though I was half a second quicker than the rest of the Pre-87 class as coming down the back straight just over half way through the session my car started stuttering and I was losing power. Coming into the hairpin the car died but I managed to get it into the pits. A really quick diagnosis from Sam my mechanic figured it was most likely the ignition switch on my dash and he rewired it to another switch and sent me to back out to check it. The chequered flag was out when I got to the bottom of the pit lane, so there was no time to set any more quick laps but I managed to get out on the slowdown lap to report back that the car was once again back on full song! I had qualified tenth out of seventeen cars which wasn’t bad, if I do say so myself! When I thought I had enough drama for one weekend, the time before race one was spent watching the rain clouds in the sky; the general consensus was that the rain would miss the track but as we set out on our warm up lap it started to rain. My worst nightmare, or so I thought! I banked on the track not being too wet just yet and set about getting my car off the line the same way as I would in the dry. This worked a treat and despite having to lift slightly to avoid another car that didn’t get away so quickly I managed to find a Formula Ford size gap between the two cars in front and I stuck it up the middle and didn’t chicken out as I normally would! I went into the first corner in eighth place and braced myself to get swallowed back up! However after a few laps I had opened a pretty decent gap to the cars behind before I had a bit of a spin at Colonial and came back in the middle of a battle between Henry Campbell and David Nicholl in a newer Reynard. I managed to get ahead of them on the back straight and battled hard to keep my class lead from Henry. I thought my chances of the win were over when on the penultimate lap Henry passed me round the outside at the hairpin. Passing the last lap board at the, I knew that I would have two chances to get the place back and I tried at Colonial but it was a bit over optimistic and I backed out to avoid contact. I set myself up to try get on the power quicker coming out of the chicane to get a run down towards the hairpin and my plan worked, I had a nose ahead coming into the braking zone and I convinced myself to brake later than I had all race in the wet conditions and as I turned in I had just about cleared the nose of Henrys car and I got the better run out of the corner to take my first Pre-87 win in Kirkistown. 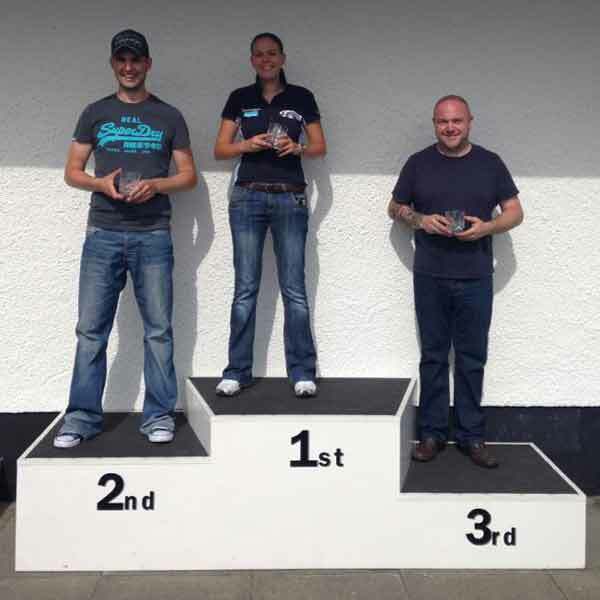 I was so happy you’d swear I’d won the overall race! It would seem I could actually drive in the wet after all, still to my disbelief. The second race of the weekend was a lot less dramatic, rain was threatening again but it thankfully didn’t come even though there was thunder and lightning during the race. I was starting second in class this time but I got the jump off the start and managed to take the lead and move up to 10th overall. I stuck on the back of the train for a few laps before I had to start heavily defending from Henry once more. 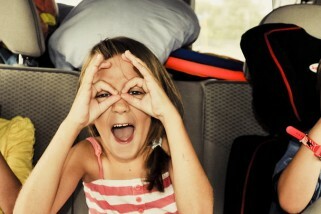 This allowed the others in front to pull away but I was fully focused on bringing home another first place trophy. I was coming under increasing pressure as the race went on but with two laps to go I could breath a huge sigh of relief as the red flag was put out, ending the race to allow another car to be recovered. I had managed to take my second Pre-87 class win of the day, secure second place in the Northern Ireland Pre-87 championship, having only competed in three rounds and I extended my All Ireland Pre-87 championship lead. Mission accomplished. I always finish off by thanking all the guys on the team for a super job but this weekend they really pulled it out of the bag and got the best out of me and the car. 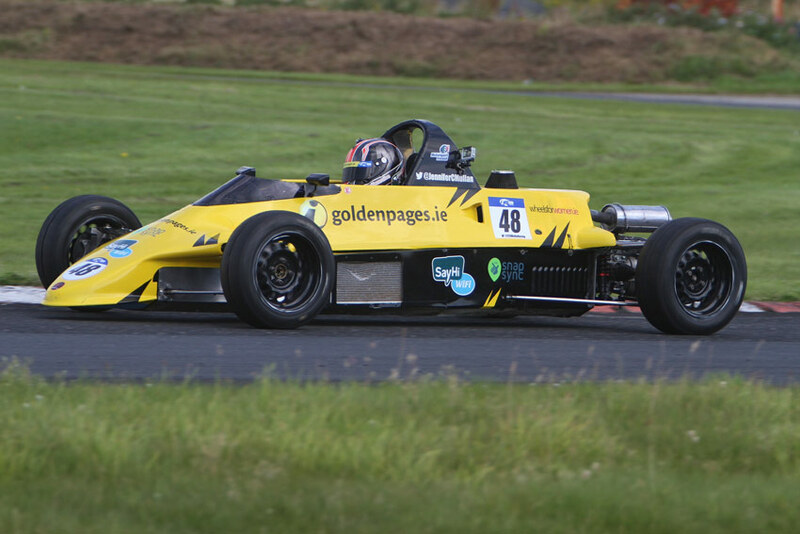 It was great to finally get some good results for them and my sponsors, goldenpages.ie, www.SayHiWifi.ie & WIFI and Snap Sync. Its now back to Mondello Park for the famous Leinster Trophy meeting in three weeks time where I will hopefully come away with class victory in the All Ireland Championship and put on a good show in the main trophy race.